Like so many adult readers, I’m expanding my reading exploration into YA literature. Some titles I’ve enjoyed recently include The Doubt Factory by Paul Bacigalupi, Adaptation by Malinda Lo, and Glory O’Brien’s History of the Future by A.S. King, (which is aMAzing). In a way, this is my third return to YA, the first being when I actually was Y myself and a wise librarian pushed a bunch of good books into my arms, the second during my undergraduate years when I discovered a branch library for the education department and decided to do an independent study on trends in young adult fiction just for fun (which it was). Now there’s a lot to catch up on as this turns out to still be one of the most intriguing segments of the book industry. So when I was offered the chance to read one of the University of Minnesota Press’s YA titles, I jumped at it. Here’s my review. 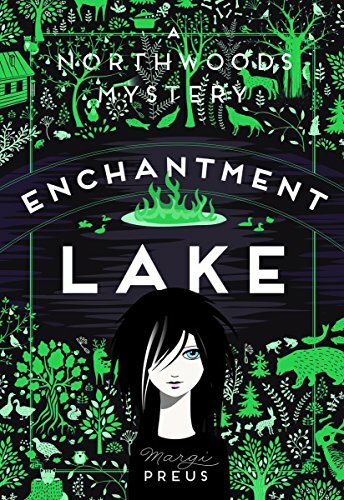 When 17-year-old Francie gets an emergency summons from her eccentric great aunts, she abandons an audition in New York to fly (and bus) home to Enchantment Lake, where many of the residents on the side of the lake that can only be reached by boat have died unexpectedly in bizarre accidents. Francie isn’t a detective, but she played one on TV, and many of the residents of Enchantment assume, despite her protests, that she is a skilled investigator. What else can she do but try to find out what’s really going on? Who is behind the effort to build a road to the side of the lake that is home to long-time residents living in modest cottages – and is that why residents are dropping dead? Though billed as a YA book, it’s really for the young end of the age spectrum and reads like an old-school Nancy Drew adventure, including the conveniently absent parents and a teen who in a matter-of-fact way has nice things, like a New York apartment and an established if precarious career as an actor. 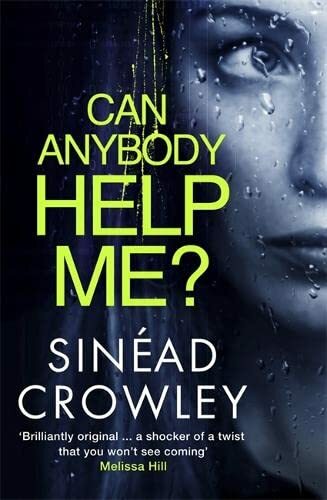 There is a lot of investigating, introducing a cast of local characters (in every sense of the word), but also a healthy dose of action and a (very) light touch of romance.In this otherwise light-hearted mystery there are the moments when Francie wonders what happened to her mother, who disappeared before Francie had a chance to know her. Those passages are a bit like walking barefoot on a sun-warmed path and feeling a momentary chill as you pass through a patch of shadow – only to step into the sunlight again. Angsty this is not, but it benefits from those moments of depth. The sense of place is also evoked nicely with bits of description that will evoke a sense of nostalgia in anyone who has ever visited a lakeside cabin up north and wishes nothing would change, knowing it will. To be honest, though, what delighted me most about this book was its design – it’s gorgeous. The cover is a Wanda-Gag-inspired patchwork of flora and fauna that includes visual hints of the mystery. Every chapter begins with a small, unique image and a page number framed by tiny loon silhouettes. It’s an old-fashioned children’s mystery with an old-school attention to design that is all too rare to find in book production today. And, for all that, the price for the hardcover is no higher than a typical trade paperback. Kudos to the University of Minnesota Press which kindly provided me with a review copy. The most recent issue of Reviewing the Evidence has a review in it I thought I’d share here (thanks to the editor’s generous policy – do visit the site, as it has a search feature for its over 10,000 mystery reviews, all provided through that mysterious process that Yochai Benkler calls commons-based peer production. You know, that part of the Internet that works as it should rather than being a vacuum for monetizable personal information and platform for showing off. It also has a “sixty seconds with” feature with this author, who manages to find some funny and informative things to say in under a minute. One of the pleasures of a hot summer day is cooling down with a book about Edie Kiglatuk, a smart and principled guide to the culture and climate of the far north. But it’s much more than a refreshing beach read. Edie’s people are the Canadian Inuit who over generations developed ingenious ways to survive the rigors of life beside Hudson Bay. Unfortunately for them, the government decided during the cold war to forcibly relocate many of them to a more northern and remote terrain, Ellesmere Island, to discourage world powers from considering it an uninhabited and available. (This historical injustice is described in McGrath’s 2006 nonfiction work, THE LONG EXILE.) While McGrath, in her fiction, introduces readers to the ingenuity of people who have adapted to life in the high arctic, she’s unsparing in counting the costs to individuals and their society. That’s not to say the book rubs readers’ noses in misery and hopelessness. Edie Kiglatuk has fought her way out of alcoholism and despair by caring fiercely for her neighbors. As this third volume in the series opens, she has taken a position teaching summer school. 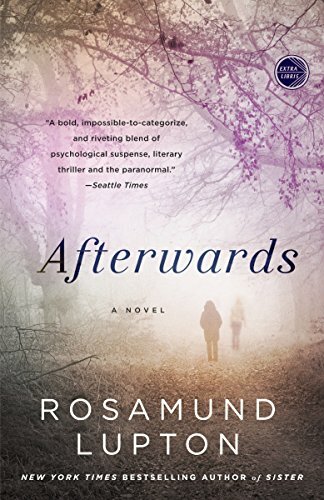 When one of her students disappears, she’s not willing to chalk it up to teenaged flightiness. She badgers the local law enforcement official, Derek Palliser (known to locals as the Lemming Police, thanks to his off-duty fascination with lemming colonies) into launching a search, and the girl’s body is found in the shallow waters of a lake. It’s a significant location. The locals avoid it, considering it an evil place. When Palliser can’t get adequate help for the investigation, he buys out Edie’s school contract to put her on the case with him. She can help, both as a scout who understands the landscape but also as a liaison to the community. But as soon as they start to look into the possibility that the girl’s killer is one of the soldiers at a nearby military installation, they run into interference from the Department of Defence, which is already well acquainted with the girl’s family. Her father has spent years fighting the federal government over land claims and has pushed to have the area where his daughter’s body was discovered, the site of an old radar station, decontaminated. It seems likely that the murder will be more than a family tragedy; uncovering a killer might just reveal uncomfortable state secrets. This is a thoroughly fascinating book that gives readers a glimpse into a part of the world that very few people know about, a place that has the austere beauty of nature when it’s bigger than its human inhabitants. 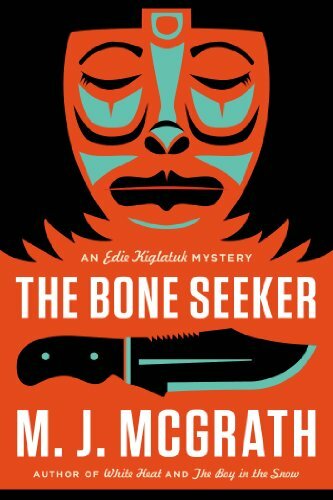 Edie Kiglatuk is a tough, resourceful, and tender-hearted sleuth with a foot in two cultures. Apart from a disappointing moment when she puts herself in unnecessary jeopardy to advance the plot, the story unfolds in a well-paced puzzle that does a beautiful job of balancing setting, character, and story. Though the investigation uncovers something bigger than Edie and Palliser anticipated, the loss of a girl’s life is never overshadowed. All in all, M. J. McGrath proves that it’s possible to honor the conventions of the genre and provide good entertainment in a story that provides even more. I didn’t have high expectations for this book, which I picked up more or less on a whim, and if I had read a description of the plot first, I probably would have put it down unread. That would have been a shame, because it was a terrific reading experience. Here’s the part that will make it sound awful: it’s narrated by a woman in a coma and is addressed to “you,” her husband. She has landed in a coma after rushing into a school that has caught fire. Her small son and the other students were safely evacuated, but when she realizes her nearly-adult daughter who is working at the school is inside, she doesn’t think; she acts. Now, she’s in the same hospital as her daughter (who is suffering from extensive burns and is sedated), and they find they can wander the halls of the hospital and talk to each other, if not to anyone else. Leaving the hospital is trickier – it’s painful, and the further they go, the more difficult it becomes – but they can manage it, just. In this way, they do what they can to learn who was responsible for the fire, which becomes particularly urgent when the police focus on an innocent person. Lupton does an excellent job making this unlikely scenario work because she’s really good at writing about emotional responses and the relationships among the characters and manages to whip up an excellent plot, as well. It includes touches of commentary on the wider world (why are privately-run schools attractive to British parents? How might money influence decisions made at the school?) but is mostly a character-driven story told with imagination and perfect-pitch language. One of the reasons I picked this book up is that I’m trying to do a better job of balancing my reading choices this year so that I don’t favor male authors though inattention. There are a lot of reasons that so much of the crime fiction I read is by men. I prefer books at the dark end of the spectrum. A lot of the books I read are sent to me by publishers to review, so they tend to be books with a publicity budget. My guess is that those budgets correlate loosely with hardcover publication, and men are more likely than women to be published in hardcover in this genre, at least going on the hundreds of books submitted annually for Edgar award consideration. I also pick up on ideas about what to read from reviews, which tend to favor male authors. All of these factors are interconnected and subtle and I’m not blaming anyone, because these biases are subtle and systemic. But what I can do is be conscious of my own choices. I have no doubt that plenty of women are writing books that will suit my tastes. I just need to make sure I’m not overlooking them. As I finished this book, I did ponder whether male readers would enjoy it as much as I did. The protagonist is a woman. Her strongest passions revolve around the need to protect her children. The drama is doing that while being disembodied and voiceless. The resolution of the crime was not entirely satisfactory for me for reasons I can’t explain without a massive spoiler. But the way the author wraps up a central dilemma in the book – one involving a mother and her children – was both satisfying and emotional. In many ways it fits the definition of a category of book I’ve always bristled at: women’s fiction. It’s by a woman, stars a woman, and is primarily about her relationships (though in this case there’s a meaty mystery to go with it). To me, books by women about women and focused on relationships are novels and I’m not sure why they shouldn’t appeal as much to male readers as to female. Thinking about the appeal of this book, though, I found myself thinking “would a man feel differently about this book than a woman reader? Would he find the relationships overdone and the emotional part of the story manipulative or mawkish?” That’s hard to say – but for me, it was great fun to read and full of narrative invention. I had a great reading month, but this book was most definitely the best of the lot. I’m cross-posting this review fom Scandinavian Crime Fiction. Later this month, the Univesity of Minnesota press will release the first volume in the Minnesota Trilogy by Vidar Sundstøl, a Norwegian author who spent two years living on the North Shore of Lake Superior. The Land of Dreams will be followed by Only the Dead (2014) and The Raven (2015). After reading the first, I’m impatient to read the rest. As the novel opens, Lance Hansen, a forest ranger who patrols the national forest that occupies so much of Cook County, a vast wedge of land stretching between the lake and the Canadian border, is on his way to speak with campers who have illegally pitched a tent near the lake not far from Baraga’s Cross. This is the kind of work he does – enforcing rules, preventing people from dumping garbage on public land, organizing search parties when vacationers got lost, occasionally encountering illegal logging or hidden meth labs. Nothing too dramatic. But this morning will be different. He parked his service vehicle at the end of the road and got out. It was 7:28. In front of him stretched Lake Superior. There was nothing to see but light and water and sky – no opposite shore on which to fix his eyes, just the illusory meeting of sky and the surface of the water far off in the distance. 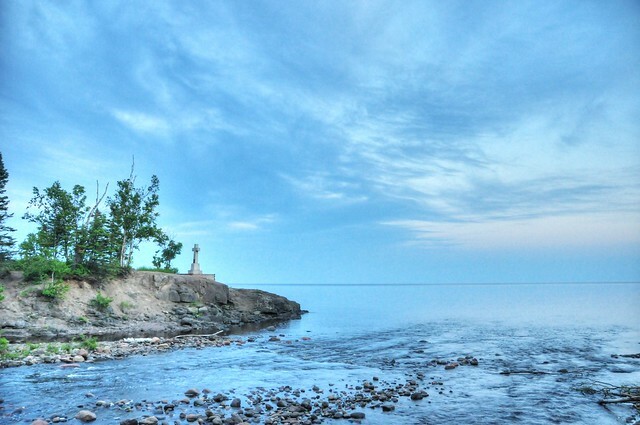 photo of Baraga’s Cross courtesy of Jeffachen. As he heads down the path toward the granite marker that marks the spot where a European missonary once erected a wooden cross after surviving a stormy crossing in 1846, he finds a shoe and a handprint marking where someone fell. Then, as he gets closer to the cross, he sees a bare leg sticking out. A naked man is sitting against the cross, covered in blood and muttering something inaudible. The intonation seems familiar and Hansen realizes he’s speaking Norwegian. Only one word is audible: kjærlighet. Love. Hansen finds another man not far away, bludgeoned to death. Soon the county’s sheriff arrives. Homicide isn’t a crime they’ve handled much. In fact, there hadn’t been a murder in Cook County in the 25 years he’s been its sheriff. Because the crime occured on federal land, an FBI agent is summoned fom the St. Paul field office, and he is soon joined by a Norwegian detective. Hansen’s involvement in the investigation is over – though there is one thing he’s holding back. He’d seen a familiar truck near the cross, one belonging to his brother Andy, who he understand less than his immigrant ancestors, whose history is stored in binders on floor-to-ceiling shelves in Hansen’s home office. As the unofficial county historian, Hansen feels more comfortable in the past, and as the FBI agent and his Norwegian colleague try to discover whether a tourist killed his companion or whether someone else was responsible, Hansen becomes fascinated by old news accounts of a body found near the same place in 1892, It could have been the body of an Ojibwe medicine man named Swamper Caribou who’d gone missing earlier, a disappearance that may be connected to an old family story about a fifteen-year-old boy crossing the lake on a winter night – and possibly to Hansen’s dream of walking under the frozen surface of Lake Superior. The Land of Dreaams, beautifully translated by Tiinna Nunnally, is an evocative novel that draws together past and present, the lives of immigrants and the indigenous inhabitants of the North Shore, American dreams and suppressed violence hidden behind calm exteriors and polite silences. In some ways this sounds like Karin Fossum’s explorations of the squirmy things living under the rocks of peaceful small towns in Norway, but in tone and style it’s far closer to Johan Theorin’s Öland quartet, which combines an atmospheric natural setting with pscychologically probing portraits and a very light touch of the supernatural. I’m not surprised that it was awarded the Riverton Prize. It’s a very good book. I admit that I particularly enjoyed a setting that is familiar to me – just a few weeks ago we traveled to the places where the story is set. Even if you haven’t been to the North Shore, this book will provide you with an interesting journey. The only problem is that you’ll want to return as soon as possible, as there is obviously more to the story. If you are in the Twin Cities, be sure to stop by Once Upon a Crime, where the author will be speaking on October 17th at 7pm. If you can’t make it, Pat and Gary will save you a signed copy. 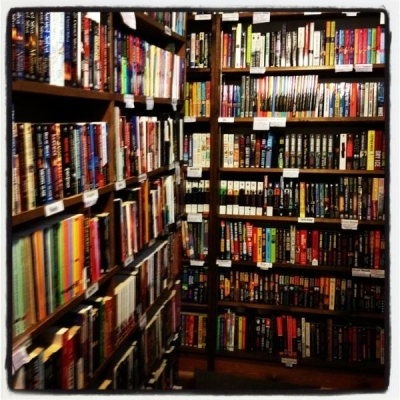 If you can go, be prepared to leave with a lighter wallet and a heavier bookshelf. It’s a great store full of temptation. But you know you need more books.